Moroccan chickpea soup at VO2 Vegan Cafe. The North End pressed sandwich at VO2 Vegan Cafe. Boston-area vegan cuisine just keeps getting better. Two breakfast-and-lunch spots — one in Cambridge, another in Watertown — are updating notions about dishes that use no animal products. Both cafes offer plenty to savor for vegans and non-vegans alike. Loureiro, together with husband Steven Carpenter, owns the 2½-year-old eatery, housed within the Cambridge branch of O2 Yoga (the original studio — sans a cafe — is in Somerville), which the couple also owns. Enter into the cafe and peer up the staircase. You’ll see yoga wear and mats for sale. Hidden from view are studios where Loureiro (a yoga teacher for 20 years) conducts classes when she’s not helming the open kitchen. “I’m a big proponent of comfort food,” she says. Soups are a specialty here. 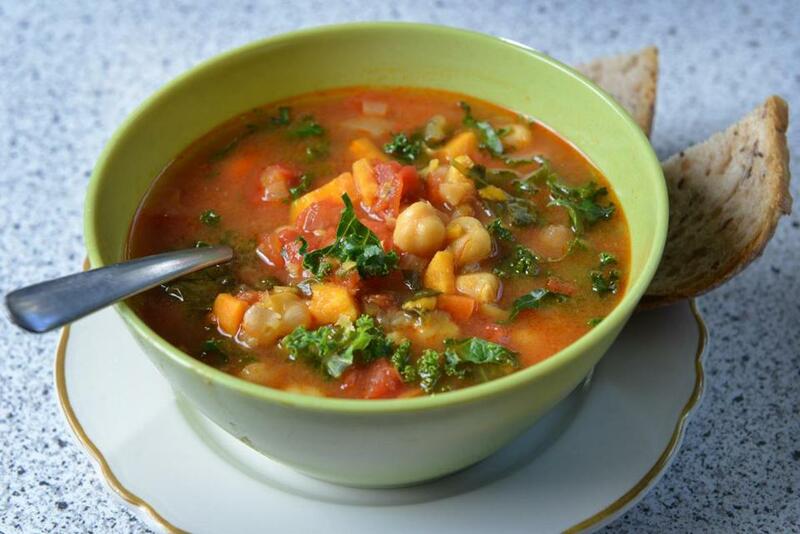 Moroccan chickpea soup ($4.25 cup, $5.50 bowl) is hearty and warming, full of sweet potato, carrot, onion, and kale in a beautiful cinnamon-scented tomato broth. Broccoli soup, with finely minced florets and cashew cream, offers a lush texture. 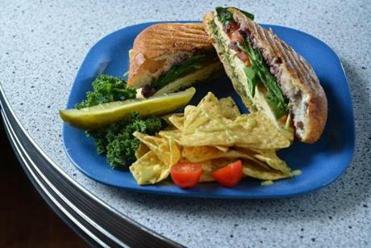 A pressed sandwich called the North End ($7.95) dresses up grilled, pressed tofu with a bright, garlicky pesto, black olive tapenade, spinach, and non-dairy cheese. It’s excellent on Iggy’s ciabatta. A dining companion asks for the filling of banh Mimi ($8.50), a take on the Vietnamese sandwich, to be plated on mesclun greens instead of bread. The barbecued seitan (springy wheat gluten) with sesame dressing is tasty but needs ciabatta to really shine. A scoop of “chuna” — mashed chickpeas, diced pickles, and onion — would be excellent on greens, like tuna salad. We enjoy ours as a pressed sandwich ($7.95) with tomato and spinach. A satisfying, frothy Green Monstah smoothie ($6.25) sports a light-green hue, with kale, lime, apple, and the zing of pineapple and ginger. Seeing the delight on the faces of customers, both old and new, pumps up the joy in Loureiro’s sun salutations. “The cafe feels like my home,” she enthuses. Fortunately, we can drop by any time we like. 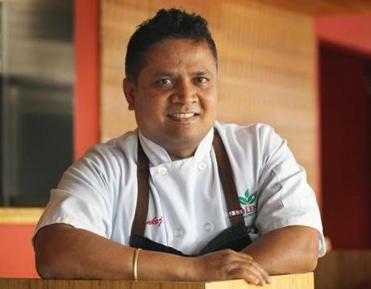 Pankaj Pradhan is chef-owner of Wild Rice Vegan Cafe. On a quiet street alongside Watertown Mall is Wild Rice Vegan Cafe, a 3-month-old eatery painted in vivid hues of violet and poppy red. Chef-owner Pankaj Pradhan is already well known for his Red Lentil Vegetarian & Vegan Restaurant, a 5-minute walk from the new place. Opening an entirely vegan spot as a second business was an easy decision. “Many of my [Red Lentil] customers would ask, ‘Can you make this dish vegan? Without dairy?’ They were all over it,” he says. Here, you also order at the counter and take a seat. Tempeh “crab” cakes ($10.99) feature cultured pressed soybeans that are finely ground, formed into patties, and deep-fried to achieve a crispy exterior, like falafel. Two of these rounds, drizzled with a raita of cilantro and cucumber, rest on top of plump pearls of couscous with roasted butternut squash, tossed in a spicy chile sauce. The dish is full of vibrant flavors, as is an “omelet” ($9.50), which rolls home fries into a chickpea-flour crepe, garnished with avocado slices and herb aioli. Some items are still being fine-tuned. The thin pancake in crepe Suzette ($8.50) is deliciously stretchy and lacy at its crisp edges, but the banana and toasted walnut halves get lost in the simmered slurry of filling. Pradhan is detailing a list of ingredients in an excellent lentil soup with kale ($5.50 cup, $6.50 bowl), seasoned with turmeric and mustard seeds, when he pauses. “It’s made with a lot of love,” he concludes. To him, it’s the most important part of the dish. Prices Salads and soups $4.25-$9.50. Sandwiches and wraps $6.25-$9.50. Smoothies $6.25-$8.25. Hours Daily 8 a.m.-6 p.m.
What to order Moroccan-chickpea soup, broccoli soup, the North End pressed sandwich, “chuna” melt, Green Monstah smoothie. All major credit cards accepted. Not wheelchair accessible. Prices Breakfast $8.50-$10.50. 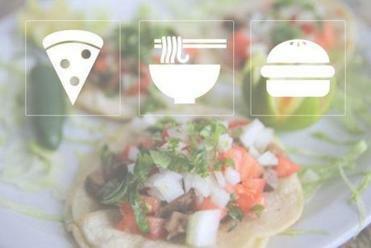 Lunch $5.50-$10.99. Juices and smoothies $5.99. Hours Daily 6 a.m.-3 p.m.
What to order Tempeh “crab” cakes, “omelet,” lentil soup with kale.